Maintenance free Orchid. Miniature, Live.! Great Gift Plant . Blooming Psygmorchis pusilla lives in modern plant technology medium. No growing tips are required for this invention. Psygmorchis pusilla is an adorable miniature orchid found in Latin America. It is a genus of a handful spaces with fan of leaves and disproportionate flower size. The plant is 2 inches which is mature and flowering size. The orchid has a flower spike on it and is blooming. Flowers are long lasting and plant will keep producing more flowers after your purchase. 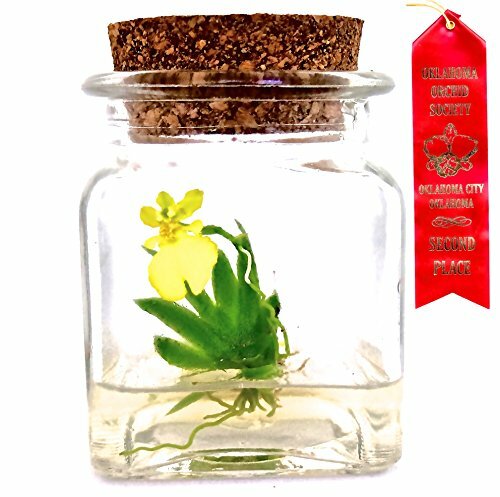 With our specially designed medium, you will be able to grow your miniature orchid in a glass bottle without watering and/or fertilizer, and enjoy it for months or up to a year in its self-contained climate within a jar. Your Psygmorchis pusilla will grow healthy and bloom repeatedly, because we insure that is comes to you with nutrition to boost its natural growth. You don't need any growing tips for this plant. Simply put it on your desk in the included 3x3-inch and 4 inches height to decorate your living area and enjoy! And it gets better! At any point, you can also transplant your plant into pot. OUR GUARANTEE: Delivered healthy with growth for a solid month... or we will send you a new plant. We are professional plant scientists who focus on developing easy growth plants that remain healthy for plant lovers. We work with a group of research scientists with state-of-the-art plant biotechnology. All of our plants are non-GMO, developed with molecular biology and biochemistry techniques. Our goal is to help everyone to enjoy beauty of plants and flowers the super easy way. ENJOY the wonder of a live plant for years to come... and a miniature orchid one at that!